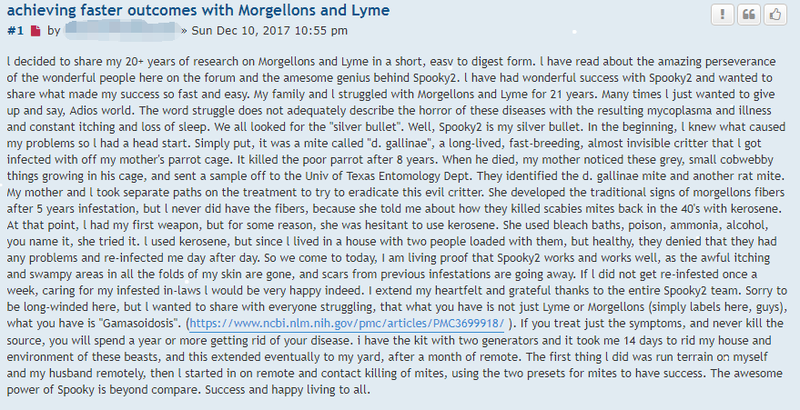 l decided to share my 20+ years of research on Morgellons and Lyme in a short, easy to digest form. l have read about the amazing perseverance of the wonderful people here on the forum and the amesome genius behind Spooky2. l have had wonderful success with Spooky2 and wanted to share what made my success so fast and easy. My family and l struggled with Morgellons and Lyme for 21 years. Many times l just wanted to give up and say, Adios world. The word struggle does not adequately describe the horror of these diseases with the resulting mycoplasma and illness and constant itching and loss of sleep. We all looked for the “silver bullet”. Well, Spooky2 is my silver bullet. In the beginning, l knew what caused my problems so l had a head start. Simply put, it was a mite called “d. gallinae”, a long-lived, fast-breeding, almost invisible critter that l got infected with off my mother’s parrot cage. It killed the poor parrot after 8 years. When he died, my mother noticed these grey, small cobwebby things growing in his cage, and sent a sample off to the Univ of Texas Entomology Dept. They identified the d. gallinae mite and another rat mite. My mother and l took separate paths on the treatment to try to eradicate this evil critter. She developed the traditional signs of morgellons fibers after 5 years infestation, but l never did have the fibers, because she told me about how they killed scabies mites back in the 40’s with kerosene. At that point, l had my first weapon, but for some reason, she was hesitant to use kerosene. She used bleach baths, poison, ammonia, alcohol, you name it, she tried it. l used kerosene, but since l lived in a house with two people loaded with them, but healthy, they denied that they had any problems and re-infected me day after day. So we come to today, I am living proof that Spooky2 works and works well, as the awful itching and swampy areas in all the folds of my skin are gone, and scars from previous infestations are going away. If l did not get re-infested once a week, caring for my infested in-laws l would be very happy indeed. I extend my heartfelt and grateful thanks to the entire Spooky2 team. Sorry to be long-winded here, but l wanted to share with everyone struggling, that what you have is not just Lyme or Morgellons (simply labels here, guys), what you have is “Gamasoidosis”. (https://www.ncbi.nlm.nih.gov/pmc/articles/PMC3699918/ ). If you treat just the symptoms, and never kill the source, you will spend a year or more getting rid of your disease. i have the kit with two generators and it took me 14 days to rid my house and environment of these beasts, and this extended eventually to my yard, after a month of remote. The first thing l did was run terrain on myself and my husband remotely, then l started in on remote and contact killing of mites, using the two presets for mites to have success. The awesome power of Spooky is beyond compare. Success and happy living to all.